I was intrigued by the fact that Doc Searls wrote this book, so I asked for a review copy. 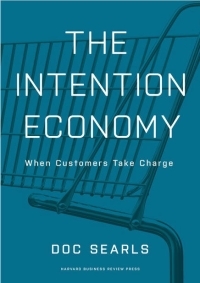 To my surprise, his assessment and overview of what he calls, “The Intention Economy” is very close to my own opinions. I’ve followed Searls’ writings for years and the book has his voice and the quality of perspective that I’ve come to expect from him. No disappointments here. This book should probably be used as a supplement to any college-level economics class as required side reading. Its 250 pages are quick reading but chock full of information. In fact, Searls takes you through some history, The Internet, Economics, Vendor Relationship Management, Customer Relationship Management and business in general. There’s one particular aspect of the book that I really like–at the beginning of each chapter, he has an introductory segment named, “The Argument” that presents the flavor of that chapter’s contents. In the chapter itself, Searls provides support for his “argument” with informative dialog and illustrative specific examples from the business world. At the end of each chapter, he provides his chapter summary named, “So, Then,” which is really your takeaway from the chapter’s contents. Producing and integrating data sets of all sizes can be a good and useful thing–especially if customers get to do it too, with their own data. We wouldn’t need to be tracked if we weren’t being cattle And we won’t solve the privacy problem until customers appear to vendors in human form. If you have any curiosity at all about business, economy or how businesses and consumers will lead tomorrow’s economy, this book is a must read. The most important business conversations in a century are about to take place and if you aren’t informed, you’ll be left behind with last century’s business models guiding you. You can’t read this book without learning something. Its easy reading style and unpretentious language is equally enjoyable for the armchair observer or the most motivated corporate bigshot. I recommend it for anyone who wants to have a jump on their competition.